The San Diego County Board of Supervisors unanimously approved Wednesday developing a program to give the owners of older taxi cabs serving San Diego’s airport incentives to switch from gasoline engines to hybrid vehicles. 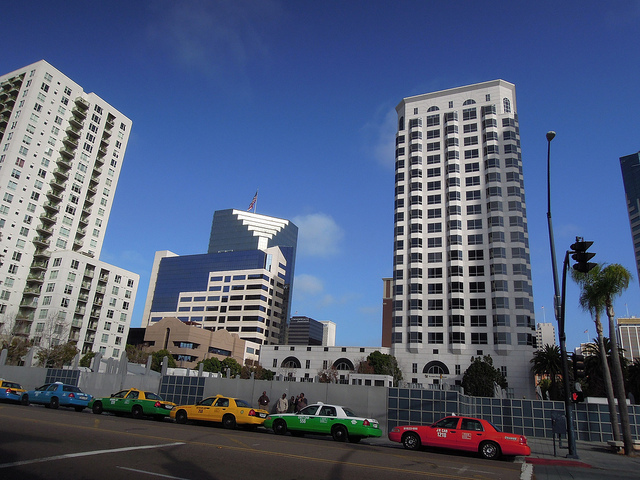 Most, but not all, of the around 350 taxis permitted to serve Lindbergh Field have already converted to alternative fuels under the San Diego County Regional Airport Authority’s incentive program, according to Supervisor Greg Cox. Since taxis often travel 100,000 miles a year, they emit far more pollution than other cars. “We have an opportunity at our airport to encourage 100 percent conversion of our older polluting taxis to new low-emitting hybrid electric or alternative fuel vehicles,” Cox said. An entire fleet of fuel-efficient airport cabs would not only improve air quality, but also serve as a visible example of the region’s commitment to sustainable practices, Cox said. Reductions in vehicle emissions would also help the region meet federal and state air pollution goals. Nick Cormier of the county’s Air Pollution Control District said the remaining taxis that transport airport passengers — 83 Ford Crown Victorias and passenger vans, which only get about 13 miles per gallon — were becoming less fuel efficient and polluting more. He said the county should encourage operators to scrap their older cars by offering an after-purchase rebate for a new hybrid or alternative fuel vehicle. “By purchasing a newer, cleaner model — usually averaging around 40-44 miles per gallon — taxi cab owners could potentially double or even triple their current fuel economy, which ultimately will mean less emissions for San Diego County and cleaner air,” Cormier said. Under the plan, taxi owners can receive between $3,500 and $4,000 from the Air Pollution Control District after purchasing a hybrid, plug-in or alternative fuel vehicle. The owners would then also pay reduced airport fees. The incentive money, which will total $360,000, is to come from a $4 per registered vehicle charge. The county’s air pollution control officer will report back to the supervisors on the program’s results in about four months. Michael Kulis of the Regional Airport Authority said it would benefit travelers to see a line of fuel efficient vehicles waiting for them. “We realize at the airport we’re oftentimes the first and last impression travelers get,” Kulis said.